Practice IOT questions and answers for interviews, campus placements, online tests, aptitude tests, quizzes and competitive exams. This set of IOT Interview Questions and Answers for freshers focuses on “Eclipse software – 2”. Explanation: In the mid-1990, a number of powerful commercial development environment were available; Microsoft Visual Studio was becoming a more general purpose tools platform. 2. IBM landscape contains ________ worlds. Explanation: This landscape actually contained two worlds: one centered on tools that enabled Microsoft’s direction on runtime execution support, the other focused on a more open industry approach centered on the java platform. Explanation: IBM Software Group began creating a development tool that eventually known as Eclipse. We first built a new Java IDE with resources from Object Technology International labs, along with the broader platform to go with it. 4. Vibrant ecosystem of third parties would be critical for achieving broad adoption of an eclipse. Explanation: Vibrant ecosystem of third parties would be critical for achieving broad adoption of an eclipse. But business partners were initially reluctant to invest in our platforms. Explanation: The consortium’s operating principles assured that open source community would control the code and the commercial consortium would drive “marketing” and commercial relations. Explanation: The eclipse platform uses the model of a common workbench to integrate the tools from the end user’s point of view. Tools that you develop can plug into the workbench using well defined hooks called Extension Point. 7. The eclipse platform defines pen architecture. Explanation: The eclipse platform defines pen architecture so that each plug-in development team can focus on their area of expertise. Explanation: Repository experts build back ends and the usability experts build end user tools. If the platform is designed well, significant new features and levels of integration can be added without impact to other tools. 9. The platform itself is built in layers of plug-ins. Explanation: The platform itself is built in layers of plug-ins, each one defining extension points of lower level plug-ins, and turn defining their own extension points for further customization. 10. The ________ is responsible for defining a structure for plug-ins. Explanation: The eclipse runtime defines the plug-ins on which all other plug-ins depends. The runtime is responsible for defining a structure for plug-ins and the implementation detail behind them. Explanation: The workbench UI is contributed by one such plug-in. When you start up the workbench, you are not starting up a single Java program, You are activating a platform runtime. 12. The ________ is a cockpit for navigating all the functionality provided by plug-ins. Explanation: The workbench is a cockpit for navigating all the functionality provided by plug-ins. By using the workbench, we can navigate resources and we can view and edit the content and properties. 13. The workbench is just a frame. 14. ________ allow the user to edit something in the workbench. Explanation: Editors allow the users to edit something in the workbench. Editors are document-centrist, much like a file system editor. 15. ________ provide about some objects that the user is working with in the workbench. Explanation: View provide information about some object that the user is working with in the workbench. Views often change their content as the user selects different objects in the workbench. 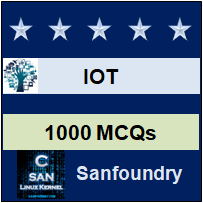 Sanfoundry Global Education & Learning Series – IOT. To practice all areas of IOT for Interviews, here is complete set of 1000+ Multiple Choice Questions and Answers.